Sandaya Les Tamaris är en camping i Aresquies, Hérault, belägen vid havet och vid en sjö/en rekreationsplats. Campingen har platser med stängsel, med skugga, utan skugga och platser med lite skugga. Sandaya Les Tamaris ligger i närheten av en sandstrand. Det finns möjlighet att hyra husbilar. På campingen finns en lekplats. För den sportige semestervandraren har campingen olika cykelleder. Det finns ett underhållning och ett fitnessrum. Vem vill inte efter en hård dag slappna av i ett beautycenter. Campingen förfogar över en utomhusbassäng och ett knattebad. I den närliggande omgivningen kan du också simma i havet. I Sandaya Les Tamaris är det tillåtet att vindsurfa. Denna inspektör gör varje år ett besök på Sandaya Les Tamaris och inspekterar campingen för ca 200 faciliteter och för andra förekommande punkter. Inspektören är en medarbetare från ACSI och arbetar inte för campingen. Well equipped campsite next to beach. Busstop outside and good for cycle exploring. Very good pool and all facilities stay open to end of season. Staff multilingual and helpful. However reception procedures chaotic and potentially dangerous due to poor signage and poor management of parking opposite that has to be used during check in. Also, the whole site feels a bit over-managed - Hi-Di-Hi like. Site was almost full one week from end of season so booking probably necessary for most of summer. Lovely site with easy access to beach. Good takeaway food and shop. Quiet site with wildlife outside the gate and nearby town of Sete a delight. Disappointing is the best word I can use ..... not '5 star'! Toilets needed cleaning - and they may have been 'tickled' once a day, however a good scrub every now and again would not have gone a miss! Pitches fairly small and access cramped so quite tricky if you have a big rig. Best thing about this site is when you get out of the site to the beach! Just a shame you cant see any of it from the pitches. Highlight was when a truck arrived outside our pitch whilst we were eating dinner to repair the road. He proceeded to tip gravel (dust and all) and rake it out. Cant say I would really expect to see that kind of activity at the end of June in a 5 star site. Tired and in need of an update - bit too much like Butlins for our taste and wont be going back. Stayed for a few nights. Loved the beach and the little village where we cycled on the flat each day. Stayed near the road and therefore on the ponds. These are mosquito invested so ensure you have spray. Very friendly site with excellent pitches and large swimming pool. New manager made a real effort offering free drinks and pizza as the weather was a bit poor. Many turned up and all the staff were there to chat with guests. Excellent cycle tracks to neighbouring villages along the ponds and canal. An excellent camp site immediately beside the beach. Pitches are a good size with Water and Drainage near bye. Good sound electrical supply. Well laid out site pitches in hexagonal groups with water, drain and electricity at the centre of each hexagon. Shaded and open pitches available. Only 6 unisex toilets in the block but were never busy even though all touring pitches in use. One tiny sink, no soap available to wash hands after using loo. Showers nice size but water not always hot and often waited a short time for a free cubicle at busy times. Shower block very dark and I found this a problem. Lights could only be switched on at night. Swimming pool imaginative and quite large. Beach a bit disappointing, bit stony. On site shop well stocked and small supermarket just down the road. A few restaurants a short walk away. Bus stop immediately outside site, we went to Sete (1.60 Euro return) which is very pretty and certainly worth a visit if you get bored of the beach and swimming pool. Vill du boka campingen Sandaya Les Tamaris eller få mera information? Det går bra med nedanstående uppgifter eller via campingens webbsida. 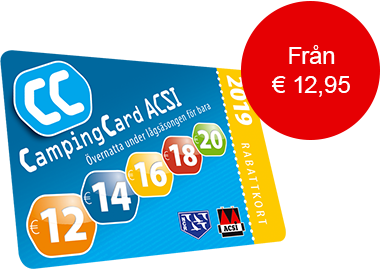 ACSI Eurocampings skickar din informationsförfrågan till "Sandaya Les Tamaris".